Download "Wealth and Investment Management Intermediaries. 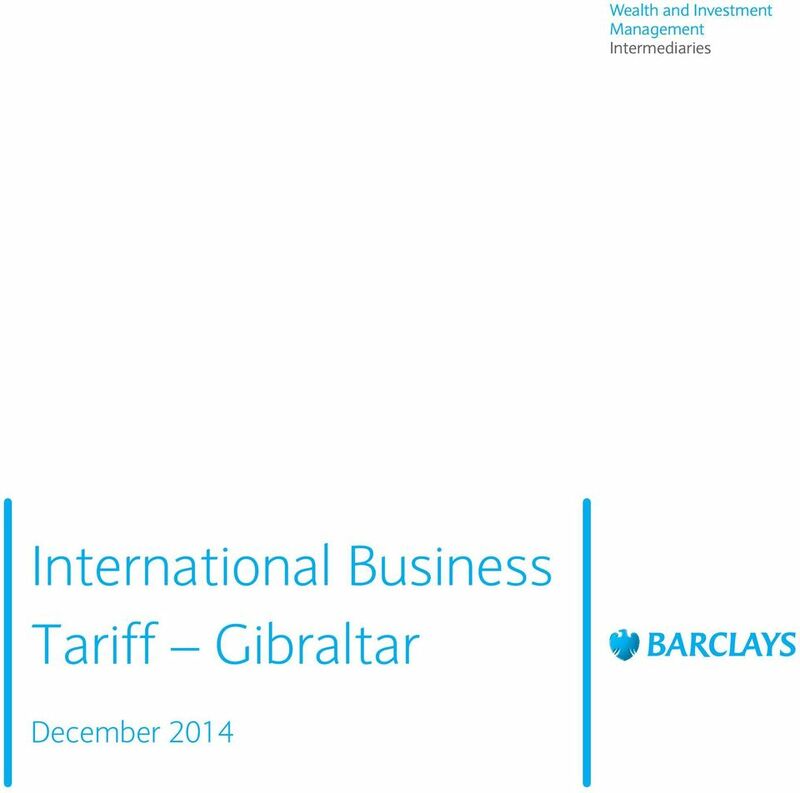 International Business Tariff Gibraltar"
2 International Business Tariff Gibraltar This tariff is applicable for accounts where the banking relationship is through Barclays Bank PLC. Prices for banking services provided to our business clients are summarised below. 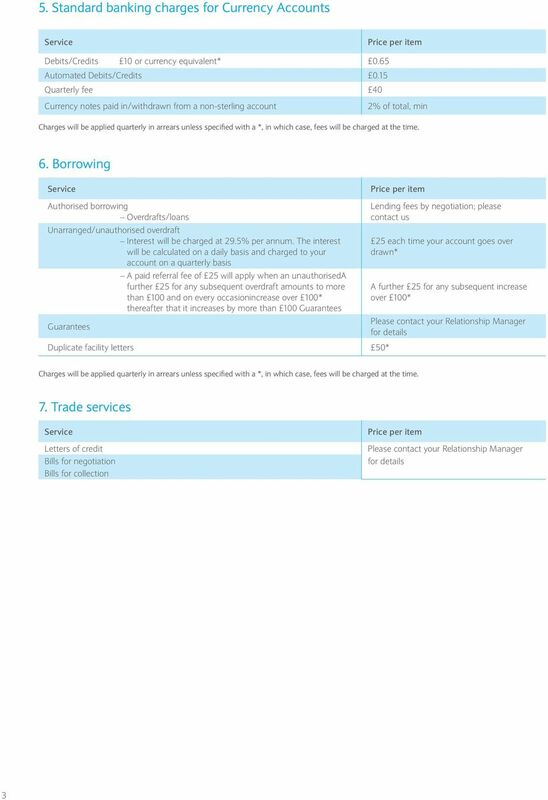 Information on prices relating to more specialised services not included in this leaflet are available from your International Banking Centre. 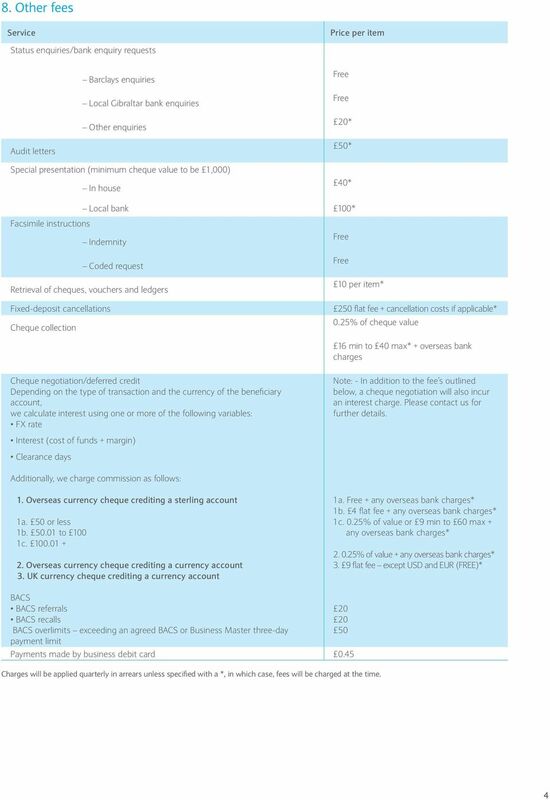 All charges are in sterling (GBP) or the currency equivalent and will be applied quarterly in arrears, unless specified* where those items will be charged at the time. The quarterly charging dates are available by request. 1. 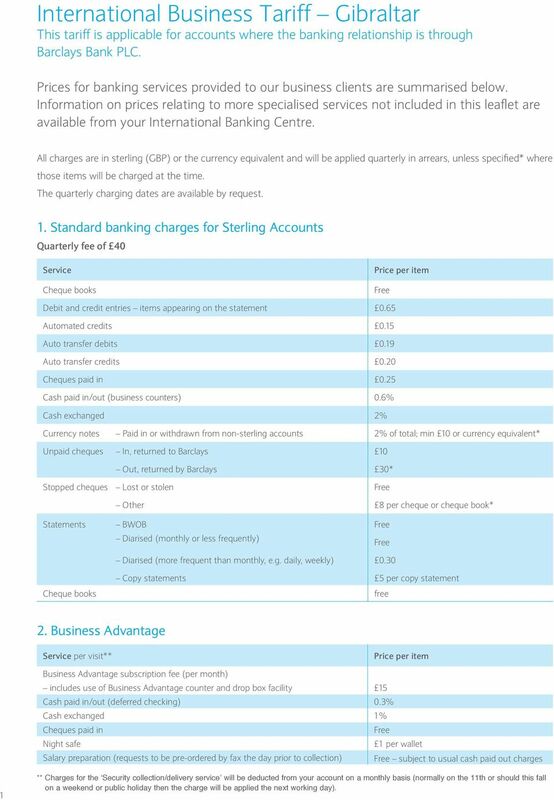 Standard banking charges for Sterling Accounts Quarterly fee of 40 Cheque books Debit and credit entries items appearing on the statement 0.65 Automated credits 0.15 Auto transfer debits 0.19 Auto transfer credits 0.20 Cheques paid in 0.25 Cash paid in/out (business counters) 0.6% Cash exchanged 2% Currency notes Paid in or withdrawn from non-sterling accounts 2% of total; min 10 or currency equivalent* Unpaid cheques In, returned to Barclays 10 Out, returned by Barclays 30* Stopped cheques Lost or stolen Other 8 per cheque or cheque book* Statements BWOB Diarised (monthly or less frequently) Diarised (more frequent than monthly, e.g. daily, weekly) 0.30 Cheque books Copy statements 5 per copy statement free 2. Business Advantage per visit** Business Advantage subscription fee (per month) includes use of Business Advantage counter and drop box facility 15 Cash paid in/out (deferred checking) 0.3% Cash exchanged 1% Cheques paid in Night safe 1 per wallet Salary preparation (requests to be pre-ordered by fax the day prior to collection) subject to usual cash paid out charges 1 ** Charges for the Security collection/delivery service will be deducted from your account on a monthly basis (normally on the 11th or should this fall on a weekend or public holiday then the charge will be applied the next working day). 6 9. SWIFTBIC and IBAN You will need to supply the SWIFTBIC and IBAN information for any payments that you make in euros to a SEPA country (any EU Member State (28 countries) plus Iceland, Liechtenstein, Monaco, Norway, San Marino and Switzerland). Banks who receive payments without this information are entitled to charge payment repair fee. 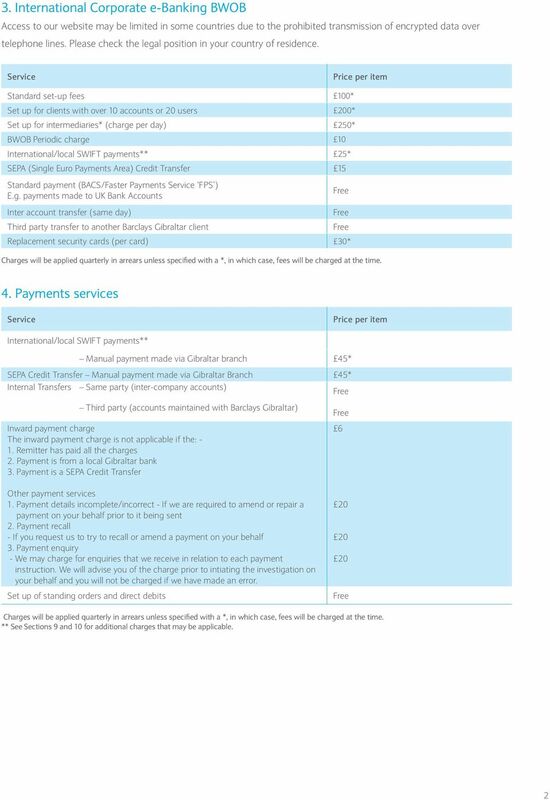 If you do not provide us with this information with your payment instruction there will be an additional 7.00 charge (or currency equivalent) made when we send your payment. Your payment may be returned or rejected by the beneficiary bank if you do not supply the SWIFTBIC and IBAN. If you do not have these details your beneficiary should be able to provide you with them. 10. 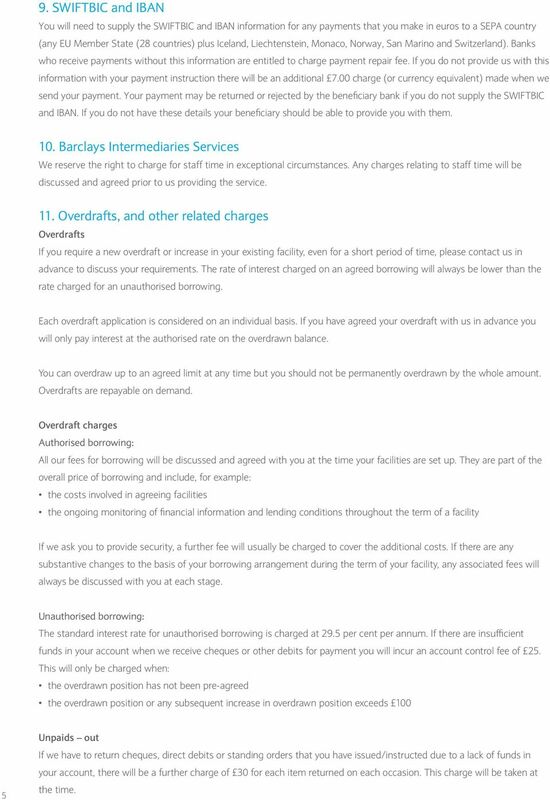 Barclays Intermediaries s We reserve the right to charge for staff time in exceptional circumstances. Any charges relating to staff time will be discussed and agreed prior to us providing the service. 11. Overdrafts, and other related charges Overdrafts If you require a new overdraft or increase in your existing facility, even for a short period of time, please contact us in advance to discuss your requirements. The rate of interest charged on an agreed borrowing will always be lower than the rate charged for an unauthorised borrowing. Each overdraft application is considered on an individual basis. If you have agreed your overdraft with us in advance you will only pay interest at the authorised rate on the overdrawn balance. You can overdraw up to an agreed limit at any time but you should not be permanently overdrawn by the whole amount. Overdrafts are repayable on demand. Overdraft charges Authorised borrowing: All our fees for borrowing will be discussed and agreed with you at the time your facilities are set up. They are part of the overall price of borrowing and include, for example: the costs involved in agreeing facilities the ongoing monitoring of financial information and lending conditions throughout the term of a facility If we ask you to provide security, a further fee will usually be charged to cover the additional costs. If there are any substantive changes to the basis of your borrowing arrangement during the term of your facility, any associated fees will always be discussed with you at each stage. Unauthorised borrowing: The standard interest rate for unauthorised borrowing is charged at 29.5 per cent per annum. If there are insufficient funds in your account when we receive cheques or other debits for payment you will incur an account control fee of 25. 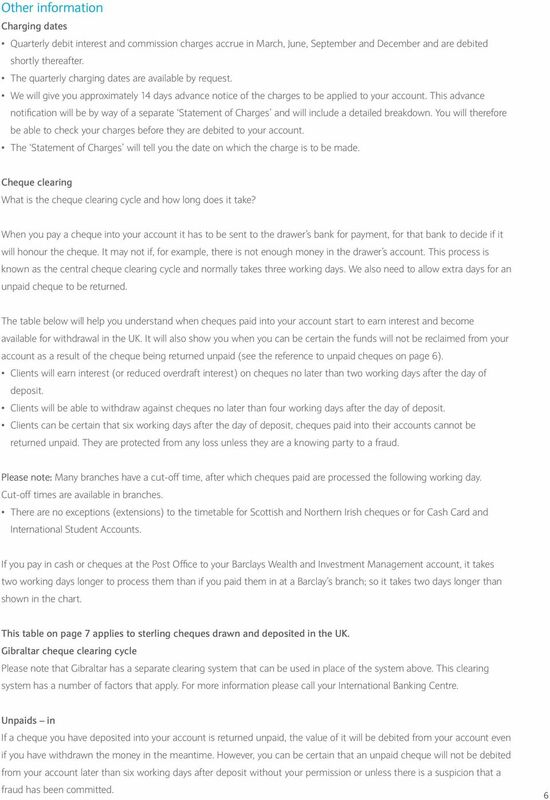 This will only be charged when: the overdrawn position has not been pre-agreed the overdrawn position or any subsequent increase in overdrawn position exceeds Unpaids out If we have to return cheques, direct debits or standing orders that you have issued/instructed due to a lack of funds in your account, there will be a further charge of 30 for each item returned on each occasion. This charge will be taken at the time. 8 Day 0 Day 1 Day 2 Day 3 Day 4 Day 6 e.g. Mon e.g. Tue e.g. Wed e.g. Thu e.g. Fri e.g. Tue Cheque paid in at any Barclays branch Inter-bank exchange Pay/No pay decision made and interest earned/reduced Returned cheques received by beneficiary s bank Available for withdrawal If cheque has not been debited to the client s account by the end of the sixth working day the cheque is paid*. * Funds will not be debited from your account as a result of the cheque being returned unpaid later than this day. As Barclays processes payments overnight, you will know at the start of business on day 7 whether or not the cheque has been paid. 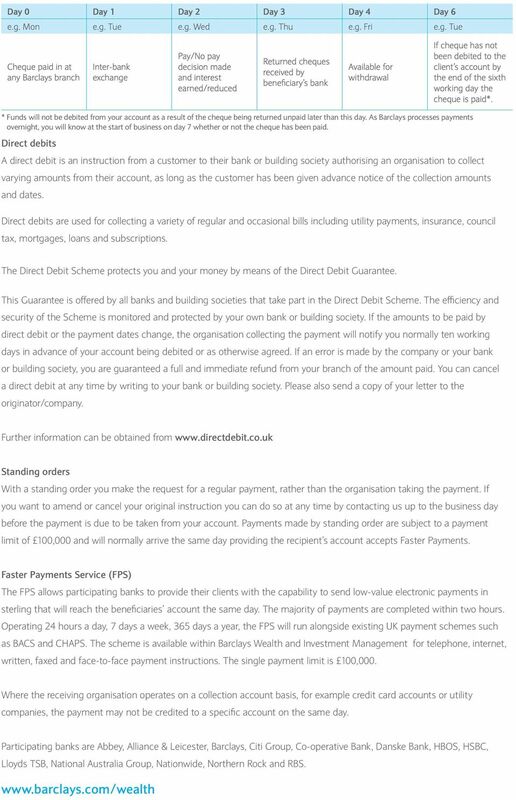 Direct debits A direct debit is an instruction from a customer to their bank or building society authorising an organisation to collect varying amounts from their account, as long as the customer has been given advance notice of the collection amounts and dates. Direct debits are used for collecting a variety of regular and occasional bills including utility payments, insurance, council tax, mortgages, loans and subscriptions. The Direct Debit Scheme protects you and your money by means of the Direct Debit Guarantee. This Guarantee is offered by all banks and building societies that take part in the Direct Debit Scheme. The efficiency and security of the Scheme is monitored and protected by your own bank or building society. If the amounts to be paid by direct debit or the payment dates change, the organisation collecting the payment will notify you normally ten working days in advance of your account being debited or as otherwise agreed. If an error is made by the company or your bank or building society, you are guaranteed a full and immediate refund from your branch of the amount paid. You can cancel a direct debit at any time by writing to your bank or building society. Please also send a copy of your letter to the originator/company. Further information can be obtained from Standing orders With a standing order you make the request for a regular payment, rather than the organisation taking the payment. If you want to amend or cancel your original instruction you can do so at any time by contacting us up to the business day before the payment is due to be taken from your account. Payments made by standing order are subject to a payment limit of 100,000 and will normally arrive the same day providing the recipient s account accepts Faster Payments. Faster Payments (FPS) The FPS allows participating banks to provide their clients with the capability to send low-value electronic payments in sterling that will reach the beneficiaries account the same day. The majority of payments are completed within two hours. Operating 24 hours a day, 7 days a week, 365 days a year, the FPS will run alongside existing UK payment schemes such as BACS and CHAPS. The scheme is available within Barclays Wealth and Investment Management for telephone, internet, written, faxed and face-to-face payment instructions. The single payment limit is 100,000. Where the receiving organisation operates on a collection account basis, for example credit card accounts or utility companies, the payment may not be credited to a specific account on the same day. Participating banks are Abbey, Alliance & Leicester, Barclays, Citi Group, Co-operative Bank, Danske Bank, HBOS, HSBC, Lloyds TSB, National Australia Group, Nationwide, Northern Rock and RBS.